Cute ideas especially created for a fun birthday party theme - the Three Little Pigs! Mix and match these ideas to create your own unique theme. Party Food, favors and more! Give each guest a pile of small sticks, hay and Lego's. Have them each build three different houses using their materials. When everyone is done see who's house can withstand the wolf by blowing up a balloon and letting the air out near the houses one at a time. Give prizes for the houses that are still standing. The Lego house will stand each time so everyone gets at least one prize. Hide plastic eggs or pieces of wrapped pink bubble gum around the party area and let the children search for the items. If you are giving away prizes place a mark or number on some of the eggs that correspond with a prize number. Let the guests keep what they find for party favors. Children try and blow 3 cotton balls across the room and back. Divide into teams and give each team 3 pink cotton balls. Across the room from the teams set up a pile of bricks or a hay bale that they will have to touch or go around before they can start back to their team. One at a time the players get on their hands and knees and blow on the cotton balls to make it move across the floor - no touching is allowed. They must blow the cotton ball across the floor to the turn-around point and back to the starting line where the next person will huff and puff the cotton ball again ... and so on until all the players have gone. The first team with all their players to finish wins. Variation: You could also use ping pong balls or any type of light ball that will move when you blow on it. This game is similar to the game of tag. Decide before the game who will be the Wolf. The Wolf stands in the middle of the playing field and the little pigs line up on one side of the playing field. When the Wolf says "Go" the pigs must run from one side of the playing field to the other. While the pigs are running the Wolf can tag them. If a pig is tagged then they also become a Wolf for the next round. Continue until there is only one pig left ... and then they become the Wolf. To carry the sticks, straw and bricks theme throughout the party decorate the party tables with hay bales, bundles of small sticks and bricks. You can place bowls of snacks on Fill pink helium balloons and tie them around the party area in groups of 3. To get the guests ready for the party as soon as they arrive tape down pig hoof prints made from paper to the driveway or walkway - add a few wolf print too! Make it fun by having the prints go in circles and wander around the walkway instead of going in a straight line. Make a few signs that say "Three Little Pigs", "Sticks sold here", "Bricks for sale" and "Danger - Beware of the Big Bad Wolf" and place them along the walkway to the party entrance. Set out a pile of bricks, a pile of sticks and a bale of hay in the front yard. You can also add a wheelbarrow, work gloves, etc. to the front yard. he front yard. You can also add a wheelbarrow, work gloves, etc. to the front yard. Decorate the front of note cards with 4 even strips of scrapbook paper in brick, straw, sticks and wolf fur patterns. Glue them onto the front of the card and write party information inside. Buy pink note cards and draw 3 curly pig tails ... or draw 3 cute pig faces with a permanent marker. Paint the faces of the party guests and turn them into a pig or a wolf. Use our homemade face paint recipes a sponge and a few paint brushes. Let the guests make houses out of graham cracker squares, pretzels, candies and royal frosting. Choose one that looks as close to a house as you can get. Take turns having one of the children be a wolf and stand at the door of the bounce house and knock saying "Little pig, little pig ... let me come in!" 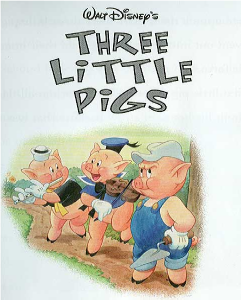 There is a cute book called "The True Story of the 3 Little Pigs" and it is told from the Wolf's perspective. Cute and entertaining for kids!